Happy Hanukkah! Happy Chanukah! 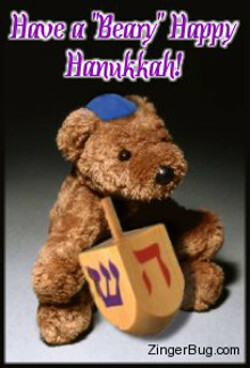 Chanukah, or the Festival of Lights is celebrated by Jewish people around the world. The celebration begins on the 25th day of the Hebrew month of Kislev (a date that varies on the western calendar from year to year). Hanukkah means "dedication", and the festival celebrates the rededication of the Jerusalem Temple after the following the victory of the Maccabees over the Syrians. The celebration commemorates miracle of the oil where, according to the Talmud, at the re-dedication of the temple, there was only enough olive oil to keep the eternal flame burning for one day, but miraculously, the oil lasted for 8 days... long enough for more oil to be pressed. 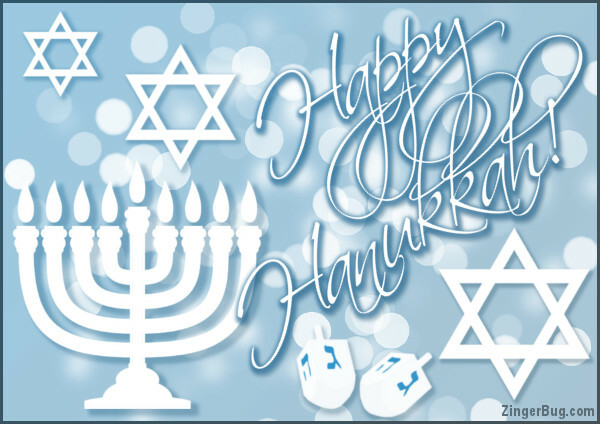 Jews celebrate the festival of lights by lighting a candle on a Menorah each night during the eight days of the celebration. A traditional holiday game for children is the Dreidel, a spinning four-sided top with a different Hebrew letter inscribed on each side. The letters form an acronym for the Hebrew words which translated mean "A great miracle happened here."